Ceramic platter features scalloped trim, hand cut out details and birds resting on twig perch icon. 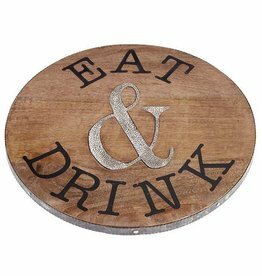 Size: 11 1/2" x 16"
Mango wood Lazy Susan with corrugate tin edge features printed "EAT" and "DRINK" sentiment surrounding center inset hammered aluminum "&" sign. Our Vento Sasha collection marries shimmering sculptural form and maximum functionality. Our medium Oval Sasha Basket features artfully crafted handles of twisted ribbons of metal. 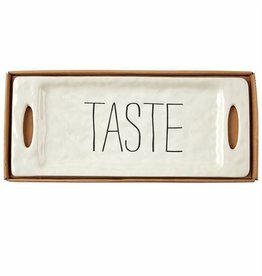 Great for serving hot dips little nibbles or any of your favorite recipes. Two-piece set. 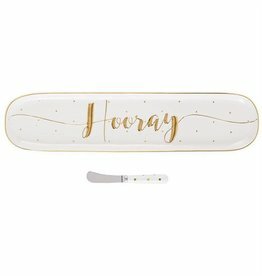 Gold rimmed stoneware tray features raised "Let's Celebrate" or "Hooray" metallic gold script sentiment and gold mini dots. Arrives with coordinating metal spreader with poly resin handle. 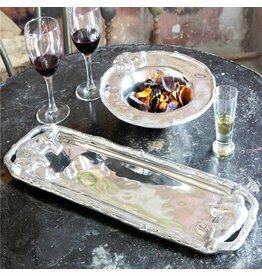 Size: tray 4" x 18" | spreader 6"
Two-piece set. 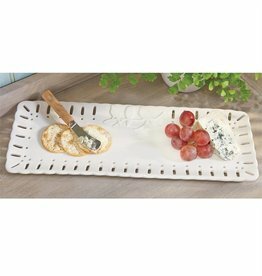 Ceramic tray features scalloped rim with hand cut-out details, embossed bird and branch icons and arrives with metal spreader with wooden handle. 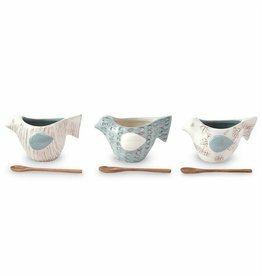 Size: tray 6" x 16" |spreader 6"
Ceramic bird shaped dip cups feature debossed, hand-painted details and dimensional wings. Dip cups arrive with wooden spoon. 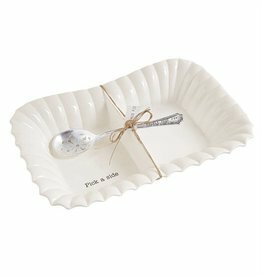 Size: cup 3 1/2" x 6 1/2" | spoon 7 1/2"
Mottled ceramic hostess tray features stamped "TASTE" message and cut-out handles. Size: 6 1/2" x 15 1/2"
Two-piece set. Mango wood board features cast metal finished birds perched on twig. Arrives with marble handled spreader. Dimensions: board 5 1/2" x 15 1/2" | spreader 6"
Two-piece set. 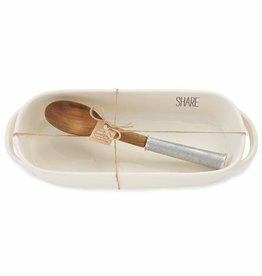 Ceramic baker features dimensional handles, with "SHARE" sentiment on inner rim and arrives tied with wooden spoon with galvanized tin handle. Baker is oven safe to 350 degrees. Size: baker 6" x 16" | spoon 11 1/2"
2-piece set. 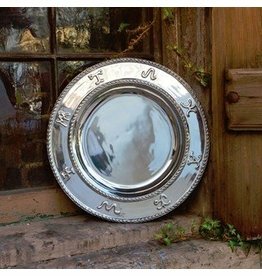 Large ceramic two-section serving dish features resist "Pick a side" sentiment and arrives tied with vintage-style "DOUBLE YOUR FUN" stamped silverplate spoon. 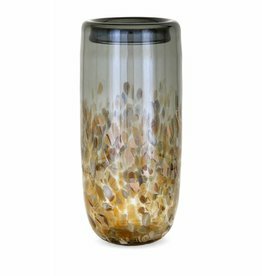 Size: server 10" x 15" | spoon 9"
Classic yet modern, this handcrafted artisan glass vase has a contemporary style in rich warm gray and light amber tones. 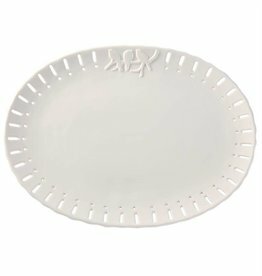 Go glam with our lovely Organic Pearl Ava Round Plate. 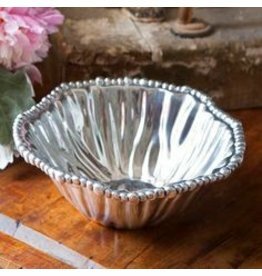 Makes a stunning centerpiece or a versatile serving piece for fruit, salads, and desserts. Perfectly proportioned, Ava works in tandem with any Organic Pearl items. 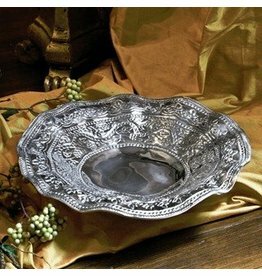 Where the buffalo roam, or in your home, the Western Buffalo small decorative silver bowl is always welcome. 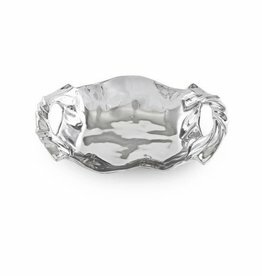 Ideal for serving snacks, sauces, and dips. 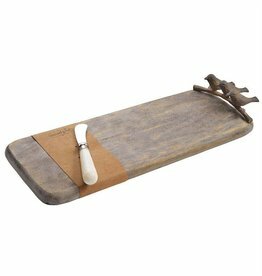 Its rustic styling and gleaming buffalo add a hint of the Old West to even the most urban table.